Rules, procedures, and strategies to shape and impact legislation. This course includes an in-depth examination of House and Senate operations. You learn points of influence in the legislative process where you can impact and shape legislation, enhancing your organization's ability to work with Congress. This is a Congressional Fellows and Presidential Management Fellows Training course. Buy all nine audio courses and save! This course and any combination of its topics are available as custom on-site training for your organization. We have tailored this course for attorneys, program analysts, scientists, SES, and others. For more information about how this training can help your staff, please contact our client liaison. 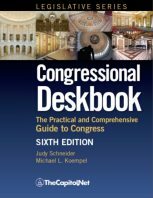 "The Congressional Deskbook is perfect for anyone who wants to understand how Congress works. It is concise, clarion clear and comprehensive all at once. It is spare and crisp -- but it never oversimplifies. It is written in lay language, but it never 'dumbs it down.' The Congressional Deskbook is a unique tool, one that I use regularly." Examine the procedures that govern floor consideration of the "rule"
Complexities of the "germaneness rule"
This course and any of its topics are also available as custom, on-site training anywhere in the United States. 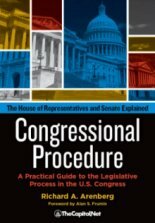 Prerequisites Working knowledge of (or a minimum of one-year's experience working with) the legislative process or completion of our course Congressional Dynamics and the Legislative Process recommended. If you have questions or need help deciding which courses you should take based on your work experience or training, please contact us via email or phone: 202-678-1600. 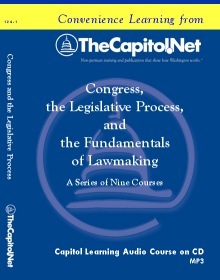 Course Materials Course materials include the Training Edition of the Congressional Deskbook. Approved for 1.6 CEUs from George Mason University. The program fee includes program development, faculty, materials, and classroom space in the DC area for up to 20 attendees (the program fee also includes AV, breaks and lunch). We will contact you after we receive your registration to finalize details. Registration and payment at least 3 weeks before the Workshop is required so the program can be customized for your specific needs. For more information see FAQs About Our Sponsored Courses. * = There is a discount if you provide classroom space in the DC area, AV, breaks and lunch. This Workshop can be also presented outside the DC area. Contact us for details. Available as custom, on-site training? Yes. This program can be tailored for private on-site training. Please call 202-678-1600 for information. "Quality of presenters is unrivaled. [Congressional] Deskbook is priceless. Another outstanding course by TheCapitol.Net." "Will improve my ability to provide informative updates on legislation and floor action affecting my organization." "All speakers were outstanding. I found the support material particularly effective in driving home the points." See more testimonials about this course. The faculty members for this course each have more than 10 years' experience in the legislative process.